Jemsite > Players, People, Music and Tours > Players & Bands, Music & Sounds, Tours & Jams, Lessons & Theory! > Jemsite members from Asia - Introduce youself! Jemsite members from Asia - Introduce youself! Just curious about other fellow jemsite members who are from / living in Asia. I moved from California to Shanghai last year, finally moved some of my gear with me last month. I am still "new" to Shanghai and I have no idea where to find a decent musical instrument store in Shanghai... help! I also want to say hello to Chris Chen. It's been a while and I'm glad to see you around. Hope to see you again someday - (PM me your contact number, I'll let you know when I come to SG next time). Re: Jemsite members from Asia - Introduce youself! David! I will never forget our trip to the conveyor belt sushi place! Too bad we couldn't have more time to jam around. We did check out some sweet jcustoms at my local music store. I'm a little older right now, just turned 24 in june. I'm done with conscription in the infantry, well at least for now; have to wait until they call me up for reservist training. I'm currently pursuing my degree in management in a program with the University at Buffalo. Things are going great, got in touch with the ole' six and sometimes seven string once again. Chops should be slightly better but somehow they're not LOL. '97 Jem77fp, '99 UV777BK, P&W poster courtesy of Kevan! Thanks man! I used to keep in touch with Walter via email, but all my links with jemsiters fell apart as soon as I donned my camou fatigues for 2 and a half years! Thanks...It was a real [email protected] to do, had to paint the wall white a couple of times to ensure eveness, and then apply the tape, then paint it red. My nice friend Iris helped me out, couldn't have done it without her. Originally Posted by Chris From Singapore. But still very cool . Great to hear from you, Chris! I guess your 2 year disappearance was probably due to mandatory military service in Singapore... now I know for sure. All my guy friends from SG all had to go through 2 years of "hell"... Nah, just kidding. Glad you are back and certainly we need to hook up when I come to SG next time. If any Jemsiter, sane preferably, is in Japan and wants somewhere to crash, please let me know. Kamakura is just 50 minutes from the sprawling megalopolis that makes London and New York look like remote hick towns. Yes, I am referring to Tokyo. It's HUGE!! 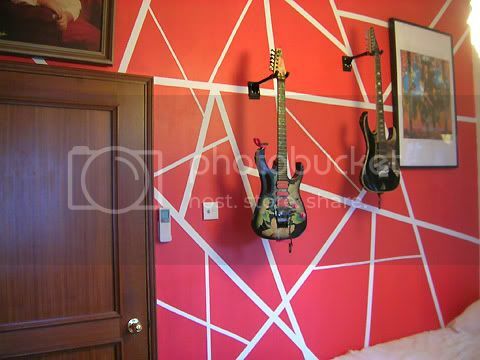 Oh btw, EVH room is a classic, I love it. I'm a 14 year old who is from Malaysia and I would like to say that Mr. Vai has become my main influence in my guitar playing (alongside Eric Clapton and Joe Perry). 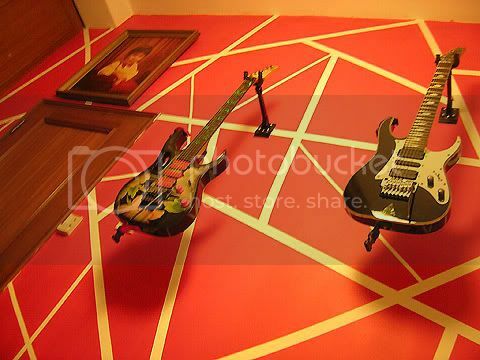 I wish I could afford that JEM and Universe like the ones David have. Anyway, I guess I'll just make do with my Mex Strat.